Karate is the martial arts, characterized by punching and kicking using only fists and feet, born in Okinawa of the Ryukyu Kingdom era. 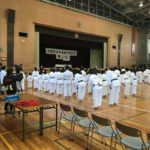 at the development of Karate in Okinawa we can identify the main areas as being Shuri-Tomari and Naha and the arts named as Shurite and Nahate. Karate was mostly practiced by the aristocracy of Okinawa, while weapons such as Sai and Bo were mainly used by the common people. Strong men and street fighters who did not practice a fighting art were looked down upon and derogatively named Chikara or Ouya (meaning ruffian) and Umai (brute). The Karate of today is primarily a striking art, however in old Okinawa it also included the practicing of Torite and Kakete (throwing and joint control techniques). Karate was taught outside of Okinawa all over Japan from the Taisho era, and furthermore after World War 2 spread around the world. Goju-Ryu Kararte is one of the big three Okinawan Karate schools including Uechi-Ryu and Shorin-Ryu. The founder Miyagi Chojun studied Naha-te from Higaonna Kanryo, and added new and original elements to the Goju-Ryu Karate system. The name was nominated by Shinsato Jinan in 1929, Miyagi Chojun’s top disciple, and later was personally ratified by Miyagi Chojun himself. The name derives from the Fujian Shaolin White Crane book of teachings (the Bubishi) edited by Mao YuanYi. 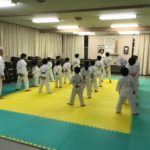 The name Goju comes from the Eight Poems of the Fists: “Everything in the universe is breathing hard and soft…,”and so Naha-te formally took the name of Goju-Ryu. As a titled martial art Goju-Ryu stands as the oldest form of Karate in Japan. Present Goju-Ryu is split in various groups, Higashionna Kanryo’s student Higa Seko, Miyagi Chojun’s student Yagi Meitoku, and Miyazato Eiichi, and Toguchi Seikichi who was a student of both Higa Seko and Miyagi Chojun, and these groups spread independently on the mainland. Miyagi Chojun was born April 25 1888 in Naha city, and grew up there; he died on October 7, 1953, aged 65 years old. He was not a big man, but a great man with piercing eyes and well-muscled. 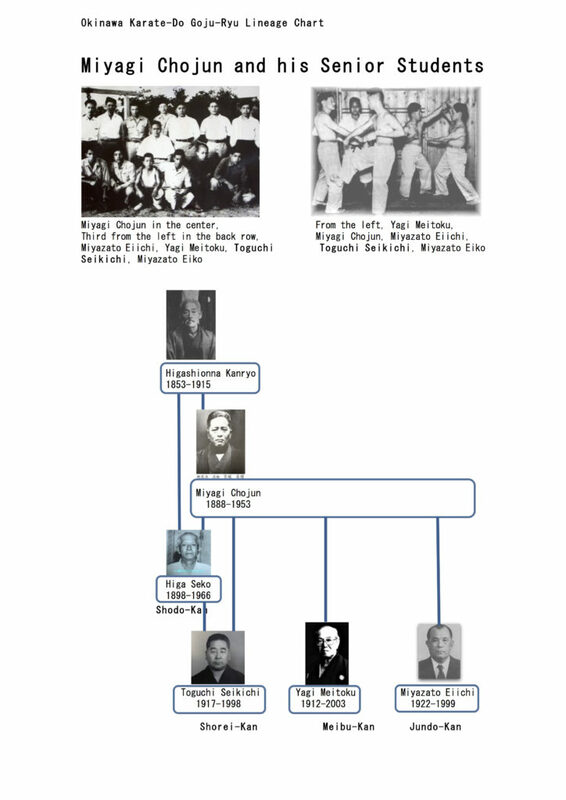 Miyagi Chojun came from a wealthy family and was able to throw himself into his studies of Karate continuing on and advancing the work of his teacher’s. He once said,”if I had devoted my time and wealth to some other enterprise, I would have been successful. But I devoted my life to mastering everything from Master Higashionna.” He made every effort, even by inviting his teacher to his home, to learn everything that his teacher could offer. He visited China twice and was a collector of documents related to martial arts. He also worked hard towards the spread of Karate around the world visiting the mainland of Japan and Hawaii teaching Karate.In Kyoto in 1919 he presented Karate-do Gaisetsu, which he wrote to introduce Karate-do and to provide a general explanation of its history, to Dai Nippon Butoku Kai (the largest martial arts organization recognized by the pre-war Japanese government) and gave a demonstration of Karate as the representative of Okinawan martial arts there. As a result, Karate was ratified as a Japanese martial art. From this accomplishment he received the title of Karate Kyoshi(Instructor) from Dai Nippon Butoku Kai. This was the first for Karate. As a part of his numerous outstanding achievements Miyagi Chojun also created the teaching system including Junbi Undo, Hojo Undo, Fukyu Kata, and other teaching elements. This teaching system was used as a reference in spreading Karate to the police and other community groups. At this time the practice of Karate was seen by the general public mostly as leading to poverty and a taste for fighting, however Karate became to be seen as a form of physical endeavor due to Miyagi’s efforts and achievements. Although a master in the Goju-Ryu (Naha-te), Miyagi Chojun wanted to study karate more completely. He visited the most respected master of Shuri-te, Itosu Anko, and asked for instruction. Itosu responded by saying, “You are a top disciple of Higashionna and you have mastered Naha-te techniques. You don’t need to study with me. If you watch my techniques, you will see what I mean.” Miyagi persisted, however, and often visited Itosu to study Shuri-te. Itosu did not teach Miyagi physical techniques; rather, he taught the theory of techniques. The 2 Fukyu Kata (Gekisai Daiichi and Gekisai Daini) created by Miyagi combined elements of hard and soft, and the early techniques reflecting the hard style of Shuri-te. Master Toguchi Seikichi received little instruction in theory in his teens and twenties and was trained in building physical attributes, when he was 30 instruction changed dramatically and he was told by Miyagi, “As you drink and smoke and have a family now, the basic training time is over, and from now on you should learn the theories and instructions.”He then taught Toguchi new forms and instruction techniques better suited to modern times. 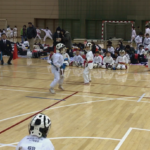 He even talked about creating more Fukyu Katas. After 65th birthday, perhaps foreseeing the imminence of death, he talked for hours at the study sessions at his house, sometimes from noon until midnight. During these intense discussions, Toguchi often forgot errands asked of him by his family on his way to the Master’s house. Often when Miyagi repeated a story and this showed on young Toguchi’s face he was told, “ The same story heard when 20 has a different meaning from that of when it is heard at 30, that is the secret. 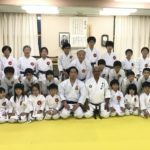 No matter how good an idea is, if it is not put into practice, it means nothing.”Thanks to intensive tuition Master Toguchi gained a understanding of the theory of Karate, expanded his world view, and was able to complete the vison Miyagi had (of an expanded Fukyu Kata series) by creating new Kata. Had Toguchi mastered mere technique without theory, he would have ended up merely a simple recorder, mechanically teaching what he had learned without the creative development of ideas. In 1911, becomes a student of Master Higashionna Kanryo. After the death of Master Higashionna, studies with Miyagi Chojun for a period of several years. In 1920, joins the police force. In 1934, at the First Butoku-Kai Demonstration on Martial Arts gives a demonstration and is given an award by Suzuki Soroku. In May, 1940 is awarded the title of Renshi by Prince Ansei. In 1966, on April 16th Master Higa passes away at the age of 68. Master Higa was an unselfish person who was able to see far into the future, and lived in a similar way to a Buddhist priest. It is his heroic episode that he does not have any special heroic episode. Once he entered the Dojo for practice he was deadly serious, though in daily life he was usually cheerful and never raised his voice. Slim, but with a will of iron, Master Higa was 165 cm tall. After the war, his wife died and he found himself alone, and started to live in Master Toguchi’s house. He spent all his life in the study of Karate. In 1969, to acknowledge Master Higa’s many achievements a memorial demonstration was held. 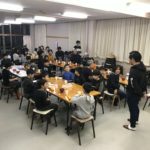 And also a discussion was held at Higa Seikichi’s (the eldest son of Master Higa) house then. Takamine Choboku said to the members gathered,“Master Higa was not interested in material things. He was a an extremely tolerant man. The training pre-war was 2 years of Sanchin, then Seiyunchin, followed by Seipai. Training in fundamentals to Yakusoku Kumite and after 8 years, free style sparring. There were no injuries in free sparring. They could well control their punching and kicking because of the series of long training. In March of 1933, enters the Dojo of Seko Higa, student of Miyagi Chojun. Receives instruction from both masters. In April of 1942, is employed as a civilian employee of the army at an oil refinery in Palembang in south Sumatra. In 1946, he is discharged from the army and returns to Itoman city. In 1948, becomes a Karate instructor for the Itoman district physical education and training group. In 1954, established the Karate-Do Goju-Ryu Kenkyu-Jo“Shorei-Kan”. In May of 1956, the Okinawa Karate Federation is established and Toguchi serves on the Board. In July of 1958, demonstrates Karate at the All Okinawa Sports Meet(in Koza city, now renamed Okinawa city). In 1959, a charity demonstration to support the building of a library at Koza Junior High School. In April of 1960, a demonstration to welcome the Antarctic observation ship “Soya”. In October of 1960, arrives in Tokyo, is an instructor at the Tokyo Yoyogi Shuren-Kai Karate Dojo. In 1962, establishes the Meguro Shorei-Kan Dojo. 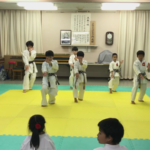 In February of 1963, Shorei-Kan Dojo opened at Hikawa Shrine in Shinmei town, Nakano ward. In May of 1963, Hosei University Goju-Kai established, Master Toguchi appointed as instructor. In June of 1963, the first Shorei-Kan Karate Tournament is held at Southern Nakano public hall in Tokyo. 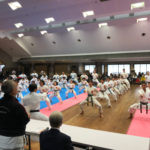 In August of 1965, the All Okinawa Karate-Do Tournament and Exhibition is held. 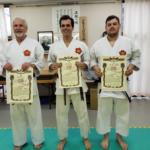 In April of 1969, with the co-operation of the chairman Tamano Genkichi and the president Tamano Tomoya of Tamano construction company, the Tokyo Honbu Dojo is established. In April of 1970, performs a demonstration at the meeting to celebrate Okinawa’s return to Japan (held in Tokyo). In October of 1970, performs an exhibition kata at the first World Karate Tournament. In May of 1972, travels to America, Canada, and Puerto Rico to teach Karate. In March of 1974, travels to various countries in Europe, America and Canada to teach Karate. In June of 1978, at the “Introduction of Okinawa Night” at the Tokyo Foreign Correspondents Club demonstrates Karate. In September of 1982, demonstrates at the Canada Shorei-Kan 10th Anniversary tournament. In August of 1983, the 30th memorial anniversary of Miyagi Chojun and the 30th anniversary Tournament of the establishment of Shorei-Kan. In July of 1985, instructional visits to America and Canada. In the same spirit as Miyagi Chojun, Master Toguchi Seikichi devoted his life solely to the advancement of Karate. 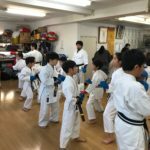 Shorei-Kan has an excellent tradition superior to other Karate Dojo as mentioned above, and we train ourselves earnestly in the Dojo and in daily life to be true to the spirit of those Karate Masters who worked so hard to create the history of Karate so far.